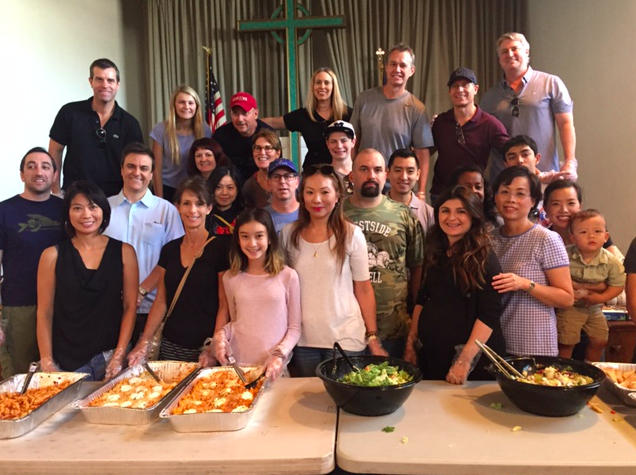 On Saturday, September 24, 8020 Consulting hosted a hot lunch for 96 people in need, serving pasta, salad and desserts from Buca di Beppo at the lunch facility at Hope of the Valley Homeless Services Center in Van Nuys, California. On an average day, between 60 and 80 people in need come to the center for hot lunch – and Saturday lunches are typically hosted by nearby businesses and other organizations. However, on Saturday, a much larger group arrived at just past noon. A total of 96 people were served – and many even helped themselves to seconds! The 8020 team was touched by the warm reception, friendliness and appreciation shown by the guests. Hope of the Valley’s Homeless Services Center provides a shower program, daily life skills classes, counseling, clothing and hot meals to those in need at its facilities at 6425 Tyrone Avenue. If you or your organization are interested in donating food items, or sponsoring, providing, or serving a meal, please contact Laurie Craft at 818-804-5508, or laurie@hopeofthevalley.org.